Q) How do you book a Rifleman Tour? 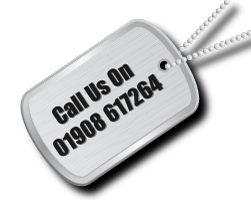 A) Phone Rifleman Tours on 01908 617264 and we will take a verbal booking and send out a booking form to you. Alternatively you can email us at info@riflemantours.co.uk and we will send out a booking form to you. Or you can download one and print off from our website and forward it to us. Confirmation in writing is needed within 7 days with your deposit of £100 in order to secure a place on a particular tour. Once the completed booking form and deposit have been received you hereby accept our terms and conditions. If the tour you wish to go on is within eight weeks of departure you will have to pay the full tour price. If we do not receive the balance, we shall be entitled to cancel your booking and retain your deposit. A) Payment is by cheque made payable to ‘Eden Tours Limited’, BACS transfer or credit card (a 3% surcharge applies to debit/credit card payments). A receipt will be sent to you once payment is received. Rifleman Tours is a trading name of Eden Tours Limited, Company Number 8915213. Q) Is my money safe? A) Yes. Rifleman Tours complies with the Package Travel, Package Holidays and Package Tours Regulations 1992. Your money is deposited in a trust account and cannot be released to Rifleman Tours until your tour has taken place. This regulation is a guarantee that you will get a full refund of all monies paid in the most unlikely event of us failing to provide the tour booked. A) Yes. You must have a valid passport. A) Yes. It is a condition of booking a Rifleman Tour that you have comprehensive travel insurance and are not travelling against medical advice. Details of the insurance arranged must be provided to us prior to your journey departure. Travel insurance can be arranged through the Rifleman Tours website. Q) I have an EHIC Card; do I still need private travel insurance? A) Yes. The European Health Insurance Card (EHIC) is not a substitute for travel insurance. Under our terms and conditions everyone travelling on a tour with us must have comprehensive travel insurance; you will not be permitted to travel without it. You can take your EHIC as this might assist with some costs you may incur under your private travel insurance. Q) I don’t have an EHIC Card, where can I get one? A) Pick up a form from your local Post Office or telephone the EHIC application helpline on 0845 606 2030 to apply for your free European Health Insurance Card. Or you can go online to www.ehic.org.uk. Q) If I am taken ill and have to cancel my tour, do I get all my money back? A) If you have taken out fully comprehensive travel insurance your insurance company should be able to refund you provided the claim meets the criteria of the policy. Full details should be available to you from your insurance company. Q) Is Rifleman Tours insured? A) Yes. We are fully covered for public liability. We also only use reputable and bonded coach companies for our tours, who comply with EU regulations for coaches operating in Europe. Q) Are the coaches non-smoking? A) Yes. But we make sure that there are regular stops for comfort reasons. A) Rifleman Tours advises you to try and keep your luggage as compact as you can and to one medium sized piece only. Q) How big are your coach tours? A) Our group sizes range from 12-24 people. Q) What is included in the price of a regular tour? A) Executive coach/minibus travel from UK, channel crossing, bed and breakfast in minimum 3 star hotel, en-suite accommodation, all museum prices (unless otherwise specified), lunch on full tour days (unless specified on tour details), plus services of guide and tour manager. Q) What is not included in the price? A) Your travel insurance, any single supplements, lunch on channel crossings, drinks during meals unless where specified. Q) I will be travelling alone; will I be accompanied during the tours? A) An experienced tour manager will be with you throughout the tour to look after you and we are often joined by single travellers. Q) I have an idea where we are going but when do I get all the information on this? A) Everyone will receive their full and up to date itinerary when onboard the coach/minibus. Q) I have to cancel my tour, what do I do? A) All cancellations must be made in writing to: Rifleman Tours, 30 Flora Thompson Drive, Newport Pagnell, Buckinghamshire, MK16 8ST. Cancellations can only be accepted in writing and it is only effective from the date we receive it. If you need to cancel you may lose your deposit. Q) What are your cancellation charges? Q) Can I make alterations to my booking? A) You may substitute another person in the place of any of your group at no extra charge, should you or any member of your group become unable to come on a Tour. Q) What if Rifleman Tours cancel a tour? A) You will be offered an alternative tour date and if that is not acceptable you will receive a full refund. Q) I want to find out about a relative who died in the Great War? A) As part of our service to customers we can recommend several research services and dependant on the information given a positive outcome will hopefully be achieved. Q) I know where my relative is buried and/or named on a memorial. Can I visit them? A) Rifleman Tours tries to adapt to meet every request to visit the last resting place of a relative or friend or to visit a memorial where they are commemorated. If it is at all feasibly and within travelling distance of our tour itinerary this should not be a problem.